When it comes to foods never to give to parrots, avocado tops every list (along with onion and chocolate). People who aren’t aware of the risks of parrots eating avocado can be very surprised. What is it about this fruit that people love so much, that puts it so out of bounds for birds? Despite popular myth, dogs and cats are not considered highly susceptible to avocado poisonining (they can experience stomach upset). 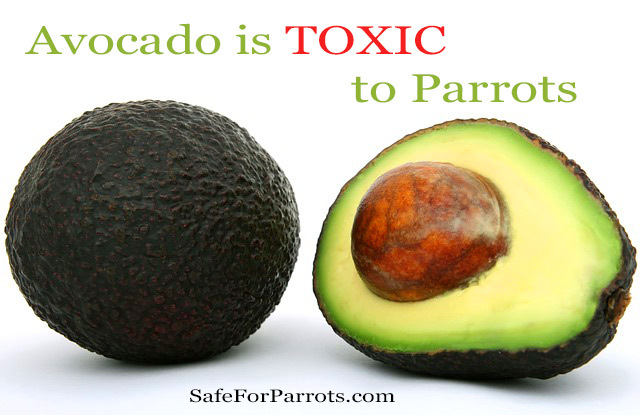 But parrots are at very high risk of avocado toxicity. Avocado plants also have very toxic effects on many mammals like rabbits, rodents, goats, horses, cows and other ruminants. This includes the fruit, leaves (considered the most toxic part of the plant), stems, bark, seeds – all parts of the Avocado plant are toxic to birds. The avocado tree (Persea americana) is found in the plant family Lauraceae. Branches from avocado trees should not be used as bird perches. Parrots that are housed outdoors in aviaries should not have avocado plants nearby, keeping in mind falling leaves which can blow into an aviary or outdoor enclosure. The culprit is the compound persin, found in all parts of the avocado tree. In birds, avocado poisoning can result in myocardial necrosis – or heart attack. Death from organ failure and heart attack (cardiac arrest) can occur within as little as 12 hours. If you suspect your bird has accessed avocado, consult your emergency avian veterinarian immediately. Avocado trees and avocado fruit should never be given to parrots. Birds should never have access to avocado trees or fruits. Since we humans love eating avocado, it’s simple common sense to not allow avocado near bird bowls, food prepration areas or utensils, nor to ever share any avocado-containing foods like guacamole, oil and pastes with parrots. Is cooking with avocado oil toxic to parrots? Hi Judy, as avocado oil is made from avocados, it is not an oil that should be utilized in foods for our birds. Better safe than sorry. Just discovered my curl cream (label M) has avocado oil as one of the ingredients – my parrot rarely preens my hair, but is it a risk to him? Only if he’s eating it I imagine Wendi – best to ask your avian vet. Potentially other ingredients in creams can be more of an issue as well. Ideally we don’t really want our parrots having access to these substances? Not always easy to avoid that’s for certain.